In writing, humor is perhaps the area where it’s hardest to disputandum the gustibus. One person’s cheeky irreverence is another person’s grating adolescent attitude; one person’s cunning wordplay is another person’s dead-obvious groaner. 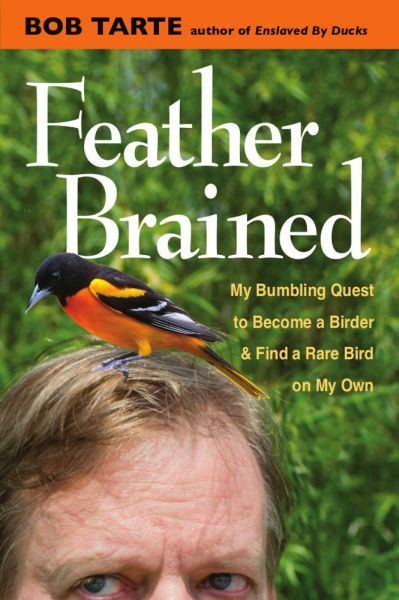 In the case of Bob Tarte’s Feather Brained, you may as well give up now if you don’t enjoy a level of self-deprecation somewhere between Dave Barry and Don Knotts. The best thing Tarte has going for him is his refreshing honesty about what he hasn’t got going for him – he comes to birding late in life, performs some spectacular botched IDs of the type that will have nearly every reader of this blog wincing and giggling in recognition, and ultimately recognizes that the best-laid plans of all birders must give way before the mysteries of the birds themselves. That said, I suspect that the primary audience for Tarte’s book is not birders. For one thing, he doesn’t seem to much like birders. He twits twitching behavior, and to be fair, even those of us who do it know that it’s sometimes twit-able. But when he finally encounters a birder who’s more interested in protecting the environment than racking up big lists, he mocks her for her concerns about trampling off path and littering. 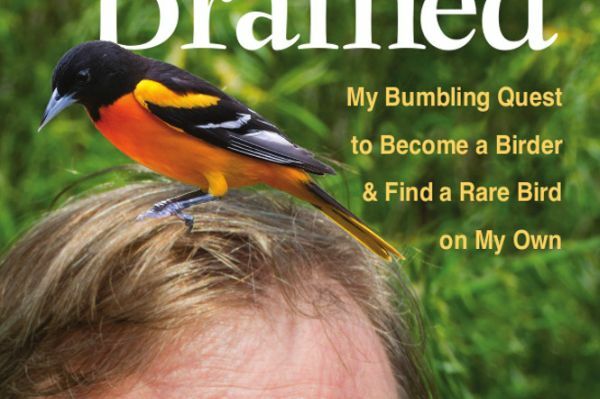 Indeed, despite a running theme that a birder should be engaged with something bigger than spotting rarities, Tarte shows very little awareness that birding might be linked to environmental issues. He blithely breezes past mentions of outdoor cats, pet parrots, and rehabilitating invasive species without so much as an eyelid flicker to indicate that these might be hot-button topics with his audience. He even describes a lovely encounter with a pair of rusty blackbirds without a word about their catastrophic decline, a particularly notable omission coming as it does only pages after a poem dedicated to the grim fate of a single vagrant murrelet. A concern with the individual inevitably trumps the big picture for Tarte, and ultimately birding for him is about individuals, individual birds (which he often anthropomorphizes) and individual people he birds with. He reaches for nothing broader. You cannot fault a book for not being what it wasn’t intended to be, and as I said, the simplest explanation for all of the above is that despite its title and cover this is not intended to be a book for birders. Tarte’s previous books feature charming tales of life with domestic animals, a subgenre typically shelved alongside nature writing but no more like it than the proverbial chalk and cheese. Viewed in that light, this book is an interesting and probably successful window into birding for people who enjoy James Herriot or John Grogan, and who might also enjoy an occasional walk in the woods in your company. Try to be gentle when you remind them not to trample the flowers. Why on earth would a book like this be published by Univ. of Michigan Press? I wondered about that myself. His previous books were all published by Algonquin. I’m sure some sort of tale hangs thereby. Where Are You Birding This Final Weekend of September 2016? Where Are You Birding This Third Weekend of April 2014?